The court granted plaintiffs' motion for summary judgment that their broadband patents were not invalid for lack of written description and rejected defendant's attempts to reargue the issue after plaintiffs amended their infringement theory. "Despite [defendant's] repeated attempts to broaden the court's claim construction, the court declines to re-cast its earlier constructions to encompass broad limitations to ATM technology to 'the invention' or 'the patents' or to add additional limitations, such as 'connection-oriented,' to the claims. . . . [Defendant] has not identified any case law that supports its contention that, after the written description requirement has been incorporated into the court's claim construction to narrow limitations of asserted claims, those same arguments and the written description requirement extend further to infringement under the doctrine of equivalents. 'This proposition not only has no authoritative support, but also runs counter to what the Supreme Court has said about the doctrine of equivalents.'" reads every patent infringement litigation docket sheet in the US district courts every day. 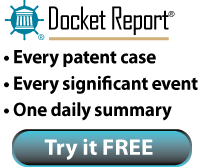 The posts you see here are a small sampling of the Docket Report...see every noteworthy event in current patent litigation, complete with free links to the underlying orders, by subscribing to the Docket Report daily newsletter.